Smartphone laser tag, or augmented reality laser tag as some may call it, has been around since around eight years. With the evolution of virtual and augmented reality in gaming, it was only a matter of time before we would be able to play laser tag with our smartphones in an augmented reality environment. So has it lived up to expectations so far? Or should we just keep it simple, forget about smartphone laser tag and just play laser tag the old-school way? Let's have a look at what's available on the market today. What Is Augmented Reality Laser Tag? Let's first get those fancy terms out of the way first. What is the difference between virtual reality and augmented reality (AR)? Woah, not as complicated as it may sound. Virtual reality is completely artificial, whereas augmented reality basically mixes virtual reality with the real world around you. It adds a digital layer of information to your reality. Isn't that cool? And surely that would work really well with laser tag, wouldn't it? Well, we're not too sure about that. Major players in the laser tag market, such as Nerf/Hasbro, have produced augmented reality laser tag products. Some of them were cool, others weren't as successful. But overall, there hasn't yet been a product that really had that wow factor. Even though smartphone laser tag has been around for some years now, the augmented reality aspect has not always been part of it. Perhaps one of the reasons for that is that smartphones evolve so quickly that any smartphone based laser tag guns get outdated just as fast, depending on the design. The cost of continuously updating laser tag guns to meet new smartphone models can be high. And with so many different smartphone brands, it's difficult to be compatible with all of them. To choose one smartphone brand over the other is a risky business decision. What Smartphone Laser Tag Products Are Available Today? So what can we choose from today if we wanted to try out smartphone laser tag? There's actually not that much available, but we have looked into 4 augmented reality smartphone laser tag products you could get your hands on right now. And with that said, let’s look at the 4 best smartphone laser tag systems on the market today. Released in 2017, the Recoil laser tag set by Skyrocket is the very latest home laser tag set available today. Recoil sets the bar high for any future home laser tag sets to enter this very competitive market. As an Augmented Reality laser tag system, Recoil uses the latest modern technology to create a digitally enhanced, multiplayer battlefield that allows up to 16 players to participate in one battle. This means that you can buy multiple sets and all guns will be able to work together. 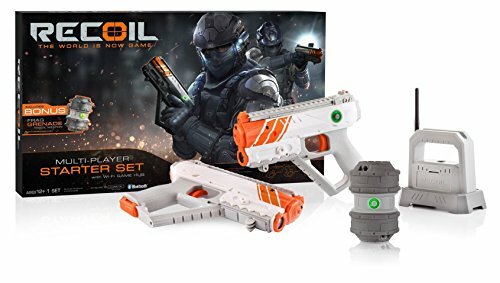 The Recoil Starter Set includes two laser tag guns (Spitfire blasters), a WiFi game hub, two smartphone mounts, two damage sensors and eight AR markers. You will also need to download the free Recoil AR powered mobile gaming app (Android and iPhone) in order to play a laser tag battle. Blasters can be easily paired to smartphones via Bluetooth. The compact blasters are comfortable and easy to use and give you an actual kickback when firing. The WiFi game hub works as a GPS enabled local network router with a maximum range of 250 feet, about the size of a football field. Recoil also features 3D Positional Audio that gives you live feedback in your ears as you battle it out with your enemies. Rather than buying multiple sets, you can also purchase individual weapons. They come in two different versions: the RK-45 Spitfire and the SR-12 Rogue. The starter set comes standard with two Spitfires. Each individual weapon comes with smartphone mount and damage sensor. The Recoil laser tag system looks very promising but time will tell whether Augmented Reality and home laser tag are a good combination. So far the reviews have been reasonably good. The very neat Father.IO Inceptor is a tech project funded through Indiegogo and it's looking very promising indeed. Father.IO brings laser tag to your doorstep. You can now play laser tag anywhere and anytime you like without the need for heavy laser tag equipment. The concept of the Father.IO Inceptor is brilliant and simple at the same time. You notice straight away that there is no laser tag gun. 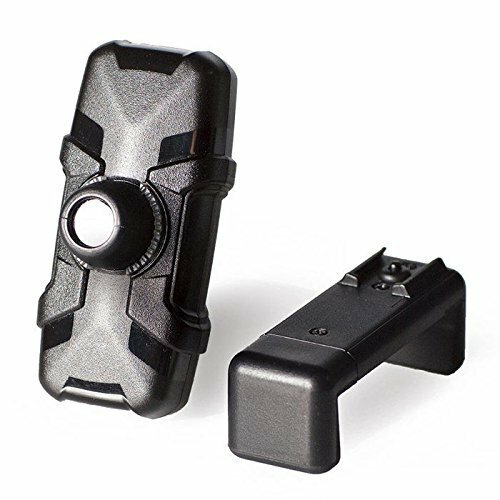 Instead, you need to plug in a device, the Inceptor, and that will turn your smartphone into a laser tag gun. Of course, you will also need to download and run the app. To user their own words: "Outdoor laser tag equipment has been reduced to the size of a key-chain". And that's true, the Inceptor is very small and can be easily connected to your smartphone (iPhone or Android). The camera on your phone captures the real world in front of you, and the augmented reality part adds an arm with a gun (which is you) and all sorts of other essential information related to your laser tag battle with other players. GPS is used to determine your location in the world. The firing range of the Inceptor is very decent, up to 50 meters. The Inceptor is also equipped with infrared receiving sensors with wide angles of reception, meaning your Inceptor becomes the target for your enemies. Get a full rundown of all features of the Inceptor on Indiegogo where you can also make a purchase. At the time of writing, the Inceptor is not yet available but can already be purchased in different packages. According to their website, the app is in the final stages of development and shipping will start in 2016. The average price of an Inceptor is around $20-$25 which is very reasonable. The app is free. Check out this really awesome video that gives us a bit of a sneak preview of what's to come with this product. We must say, it does look very promising and we are very tempted to buy a set for ourselves. 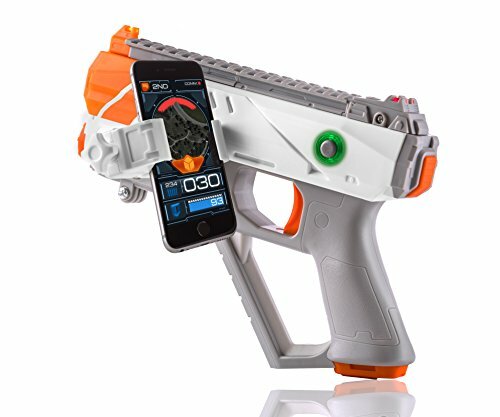 The LTAR system by Nerf was Hasbro's attempt to break into the smartphone laser tag market. The LTAR blasters certainly are very decent laser tag guns that also work just as fine without a smartphone locked in. The augmented reality aspect is really nothing more than an added bonus to an already awesome laser tag set. They are also compatible with the team modes of the Phoenix LTX taggers. This product is designed for iOS devices only (iPhone/iPod), so you won't get very far if you have an Android or any other type of smartphone. Make sure you check compatibility with the latest iOS models though before purchasing. But as mentioned, these guns work great without smartphones as well. 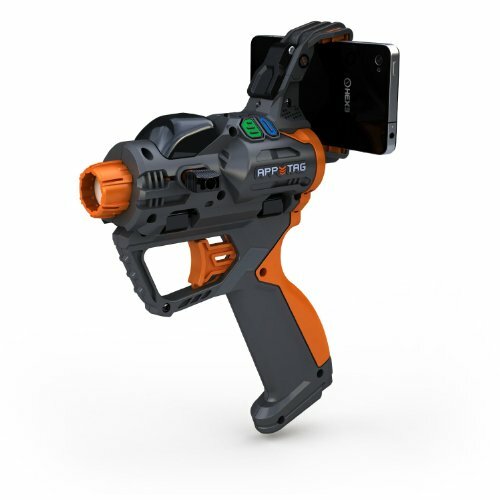 The HEX3 AppTag blaster was originally funded through kickstarter back in 2012 and the end-product appeared to be quite a neat smartphone laser tag gun. It was designed to work with iPods, iPhones and Android devices. It doesn't look like this blaster is still in production but you can still get it on Amazon, although we would not recommend buying one. It doesn't have the best reviews there, but that's partly because the games in the app store aren't free. And they aren't exactly cheap either, unfortunately. We can't work out whether the AppTag is compatible with the latest smartphone models. According to the information blurb in one of their app descriptions, it goes up to the latest iPhone models, but we are not sure. In short, we would rather stay away from this one. We're not sold yet to smartphone laser tag and we don't know whether it will ever break the market. You see, the cool thing about laser tag is that it feels like you're playing an old-school shooting game. And adding virtual reality or augmented reality into the mix, kind of eliminates that old-school fun of shooting each other. Or maybe we are just too old-fashioned? We are excited though about the Father.IO Inceptor and we do hope they can become a hit. The Inceptor is very affordable and looks like the real deal. We will be following their progress. And the 2017 release of the Recoil laser tag system by Skyrocket is also a huge step forward in regards to smartphone laser tag. >> Check out our list of best laser tag guns available on the market.